Andrew was in a political mood at the July 5, 2016 edition of Tuesday Funk. Coming off the holiday weekend, Tuesday Funk was the perfect way to ease back into the real world -- especially since the beer was cold and the Hopleaf's air conditioning was working. Maggie Jenkins got us started with a story about becoming a karaoke hero in enemy territory. Leland Cheuk read an excerpt from his novel The Misadventures of Sulliver Pong, after which Scott Smith delivered a powerful essay on the broad brush the South Side is often painted with. To wit: "Myths are stories we tell ourselves to explain things that seem far away. Things that we don't understand. And for a lot of people, the South Side is a myth." After the intermission, cohost Andrew Huff shared his patented topical haiku, and Hannah Gamble echoed Scott with an essay on race, bias and revolution, as well as a second essay -- disguised as a poem -- about the treatment of women in film and its relationship to sexuality. 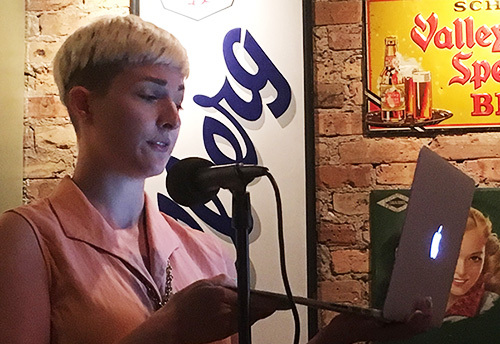 Kendra Stevens Closed out the night with a story about how fixing her teeth revealed self-consciousness she didn't realize she had. Miss the show? You can watch the readers on our YouTube channel, along with videos of past shows. We'll be back on Tuesday, Aug. 2 with guests Ryan Bartelmay, Ines Bellina, Vojislav Pejovic, Angel Simmons and Connie Voisine. Hope to see you there! Reminder: Tuesday Funk #95 is tonight! Come celebrate your Independence Day hangover with your pals at Tuesday Funk! Tonight we've got Leland Cheuk, Hannah Gamble, Maggie Jenkins, Scott Smith, and Kendra Stevens! Plus your faithful co-hosts Andrew Huff and Eden Robins, naturally. Maggie Jenkins is a comic, writer, runner and rapper. 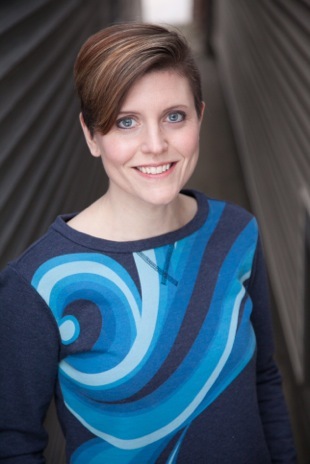 She has been a featured performer at Story Club, Essay Fiesta, Write Club, the kates and the Chicago Women's Funny Festival, among many others. 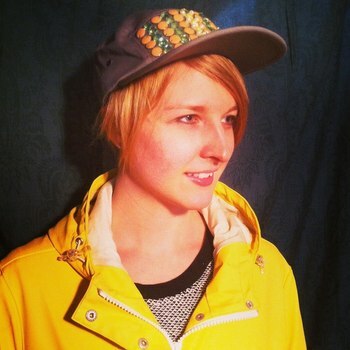 She's a member of Chicago's all-female Beastie Boys tribute, She's Crafty. Find out more at maggiekay.org. Please join Maggie and all our amazing readers on Tuesday, July 5, 2016, upstairs at Hopleaf at 7:30 pm. This 21-and-older event is free. Kendra Stevens is a Chicago-based writer, Live Lit performer, comic, rapper and obsessed pet owner. She is a co-producer of the monthly show, Serving the Sentence, is an original member of the kates, a Write Club victor, and has also been featured at Story Club, Essay Fiesta, Story Sessions and Guts and Glory (RIP), among others. 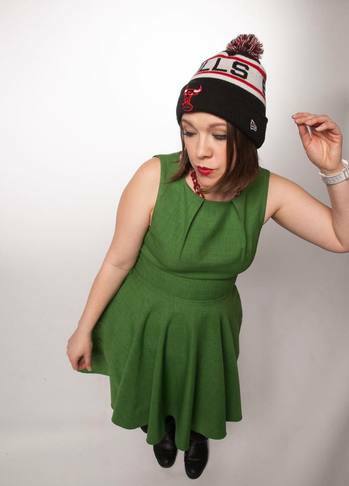 She is also one-fourth of Chicago's All-Female Beastie Boys Tribute, She's Crafty, spitting rhymes as Ken D.
Please join Kendra and all our amazing readers on Tuesday, July 5, 2016, upstairs at Hopleaf at 7:30 pm. This 21-and-older event is free. Hannah Gamble is the 2015 winner of the Neil Postman award for metaphor from Rattle magazine. She will be giving talks this summer at the Chicago Art Institute and the 2015 Printer's Ball, and will have new poems out in Pleiades in a couple months. Follow her on twitter @hannah_gamble and on Instagram @wrath_hats. Please join Hannah and all our amazing readers on Tuesday, July 5, 2016, upstairs at Hopleaf at 7:30 pm. This 21-and-older event is free. Leland Cheuk is the author of the novel The Misadventures of Sulliver Pong (CCLaP Publishing, 2015). The book was an Amazon National Bestseller in Asian-American Literature, a finalist for the James Jones First Novel Fellowship, and a semi-finalist for the Big Moose Prize from Black Lawrence Press. 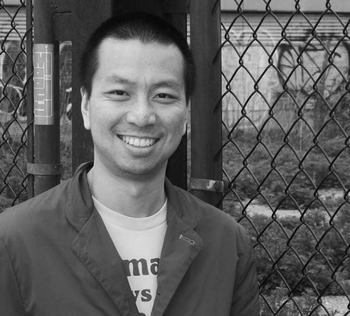 Cheuk has been awarded fellowships and artist residencies including one from the MacDowell Colony, and his work has appeared or is forthcoming in publications such as Salon, Electric Literature, The Rumpus, Kenyon Review, Prairie Schooner, [PANK] Magazine, Bartleby Snopes, The Margins, and elsewhere. He is also an assistant fiction editor at Newfound Journal. He lives in Brooklyn. Please join Leland and all our amazing readers on Tuesday, July 5, 2016, upstairs at Hopleaf at 7:30 pm. This 21-and-older event is free. 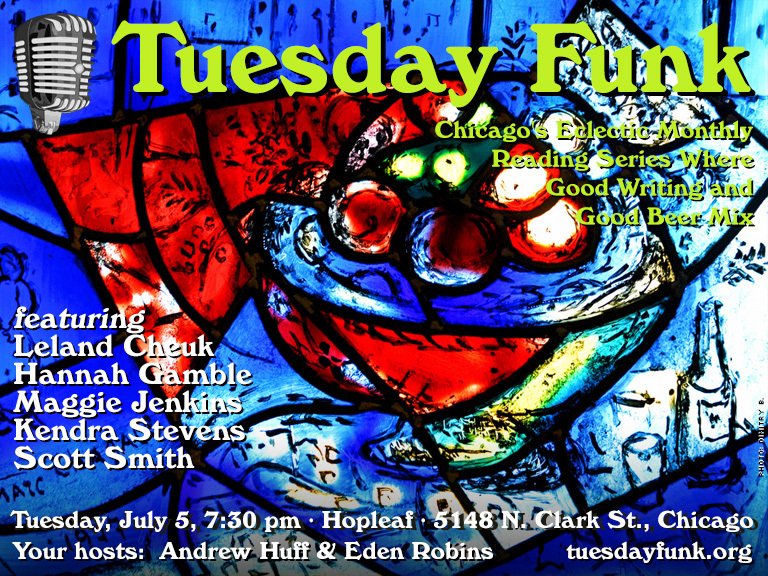 Your favorite eclectic monthly reading series, Tuesday Funk returns the day after Independence Day, July 5! Join us in the upstairs bar at Hopleaf for readings by Leland Cheuk, Hannah Gamble, Maggie Jenkins, Kendra Stevens and Scott Smith! Andrew Huff and Eden Robins are your faithful co-hosts, and Sal will be behind the bar to serve you a tasty beverage or two. Doors open at 7pm -- no earlier, please! -- and the show starts at 7:30 sharp. So get there early to grab a seat, but not overly early. As always, admission is free, but you must be 21 or older. And come early or stay late after for some great Belgian-style food downstairs. Please RSVP on Facebook, and bring a friend. And become a fan so you never miss an invitation to one of our readings. Oh, and we're now on Instagram! Follow us for realtime photos of the readers! This page is an archive of recent entries in the Reading # 95 category. Reading # 94 is the previous category. Reading # 96 is the next category.